After the launch of the recent blog post by Kelsie from WellnessbyKels.com who talks about her experience using our McArthur Skincare Complete Skincare Soap, we have decided to offer a special deal this week on both our soap and body wash products – save a massive 25% OFF online using the coupon code: SOAP25 at the final stage of checkout. This offer is not available in conjunction with any other offer. Sale offer expires Midnight (AWST) Wednesday 26th April, 2017. Need assistance ordering? Phone our friendly team on 1800 729 729. Deep cleanse with the built-in moisturising action of McArthur Skincare’s Complete Skincare Soap. Containing a generous concentration of 20% McArthur Pawpaw Extract™, McArthur Skincare’s Complete Skincare Soap uses the power of Pawpaw (Papaya, Papaw) to gently cleanse, rejuvenate and exfoliate the skin to leave your skin feeling soft, moisturised and smooth. For a feeling of a real silky fresh clean on your skin, you probably can’t find anything better than this soap bar. It is suitable as an everyday cleanser all over the body, including the face. 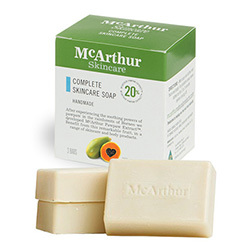 This unique pawpaw soap is often used in conjunction with McArthur Skincare’s skincare and facial creams. Looking for a body wash to gently cleanse and exfoliate while maintaining ultimate skin health? At McArthur Skincare we have created a Complete Skincare Body Wash that uses active natural ingredients brought together to give you a gentle, invigorating and effective all-over clean. This rich, moisturising pawpaw body wash provides a natural cleansing that leaves the skin soft and smooth. The natural ingredients cleanse and refresh both skin and pores without drying or damaging the delicate surface of the freshly exfoliated skin. 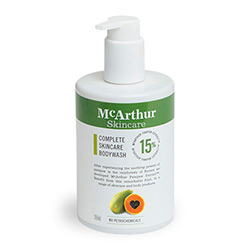 McArthur Skincare’s Complete Skincare Body Wash is a luxurious, exfoliating cleanser which contains 15% McArthur Pawpaw Extract™. It is suited to all skin types and is ideal for sensitive skin.